Whether you need baling wire and ties for manual tie balers, low volume automatic balers or high volume automatic balers, Innovative Design Concepts can supply your requirements. Unlike the open atmosphere heating and rapid cooling associated with strand or partial annealing, our products are fully annealed using controlled atmosphere bell annealing furnaces. KleenGreen® bale ties offer a clean, green, non-toxic protective coating. Engineered to incorporate the superior characteristics of black annealed wire such as ease of workability, greater ductility, and less breakage. Bundles contain 125 or 250 wires. 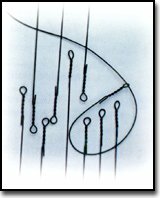 Wire feeds from either the center or the outside of the coil. 100 lbs. coils packaged 36 boxes to a pallet or 50 lb coils packaged 45 boxes to a pallet. Wire sizes - 91/2, 10, 11 and 12 gauge. Packaged on tubular steel carriers. Wire sizes 91/2, 10, 11, 12, 13 and 14 gauge. Slinger rings and carbide guide tubes which reduce wire drag to the balers are available. 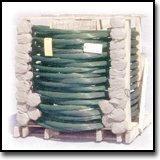 To order your choice of Baling Wire and Ties from Innovative Design Concepts, either use the forms listed at the Contact Page or call us direct at 1-419-483-5556.